During your stay in St Petersburg you might feel like enjoying a meal, drink or dessert in a less sophisticated setting with a home-like atmosphere. If this is what you are after, you can find many nice Russian cafes in St Petersburg located on and around the famous Nevsky Prospekt that serve tasty food and will make you feel at home. Cafe Restaurants in St Petersburg, Russia. In Russia almost all cafes operate as restaurants as well. In these cafes you can drink, indulge in a slice of cake or have a full basic meal with a glass of wine at reasonable price. These establishments may all look different, but almost all of them offer a casual setting, warm atmosphere and authentic Russian cuisine, mixed with a twist of modernity and a European feel. Tip: Although it is recommended to book a table in advance before heading off to any restaurant in the city, if you are thinking to go in one of the cafe restaurants listed on this page this custom is not really necessary as Russian people usually choose these places for just a quick bite, so you'll easily find a place to seat without booking. Fresh Produce, Healthy Dishes, Incredible Experience! Whether you're visiting majestic St. Petersburg or you live here, we highly recommend a visit to one of our new market-style cafe restaurants called Fruktovaya Lavka, meaning fruit shop! There are two locations: one on beautiful Vasilievsky Island just across the Neva River and the other on glamorous Bolshaya Konnushnaya Street not far from the Hermitage. The market has an incredible array of high quality, exotic fresh fruit and vegetables from around the world, along with assorted cookies, nuts and other imported products, while the cafe restaurant uses the same superior, fresh ingredients for their exquisite dishes! Traditional Italian food, Unique atmosphere, Home-made pastas! We like to describe Caffe Centrale as a cross between a 1950's American diner and a traditional Italian pizzeria. It is one of Saint Petersburg's most original cafe restaurants, with old-style Electra cruiser bikes hanging on the walls, red-chequered cloths on the tables and parfait glasses filled with ice cream. If you're looking for a fun and cheerful place to enjoy outstanding home-made pastas, pizzas, risotto, ice cream with fresh fruit, soups or coffee, this is the place to bring your heartiest Italian appetite! Superb steaks, Welcoming atmosphere, Tasty desserts! Though off the beaten track, Cafe Abajour is not that far out of the way; so if you're looking for a superior steakhouse, this is one of the best hidden secrets in Saint Petersburg. Juicy, flavorful and cooked to perfection, this is a steak lover's cafe. Highly-professional service in a cozy, unpretentious atmosphere also makes Cafe Abajour a great place to relax with friends and family or enjoy a romantic meal. The wine selection and desserts on offer perfectly complement the menu, so leave room for some delicious home-made cheesecake or carrot cake. Historical Ambiance, Live Music, Russian Fare! Established in 1916, Literaturnoe Cafe has an old world ambiance, it's like entering a19th Century home with a soft candlelight atmosphere. Known as the place where Alexander Pushkin ate his final meal, a wax-like figure of the great Russian poet, with pen in hand, adorns the front window. Here, you will experience warming, filling, home-style Russian cuisine against a background of lovely classical music. Flavorful dumplings, caviar, chicken in cream sauce, finished with Napoleon cake is only one suggestion from an extensive menu served by wait staff wearing white gloves. This is one of the best cafe restaurants for an impeccable Russian dining. Charming setting, English menu, Excellent bakery! A quaint, Russian cottage-style setting with comfortable, homey décor, Cafe Gosti is a charming place to enjoy hearty risottos and pastas or a salmon fillet with cream cheese and red caviar. Not only is this enchanting cafe known for its amazing food and delightful wait staff, they also offer a convenient English menu, which makes it a popular spot for visitors to our great city, known as the Venice of the North. After your meal, we recommend you take a moment to browse the bakery and enjoy some of the delicious pastries and desserts. Contemporary meeting place, Fusion cuisine, Jet-setter's choice! If you want to join St Petersburg's rich and famous under a countryard draped in white curtains, then go to Cafe Shater. With comfortable couches, throw blankets and tables decorated with fresh-cut flowers, this cafe is an experience unlike any other. As one of the Northern Capital's most distinctive cafe restaurants, you'll be swept into a garden party atmosphere and served by an attentive and gracious staff. Perfect for joining your friends on a sunny day or sharing intimate moments with someone special. International cuisine with a twist and jazz music only add to this exciting and exclusive venue. Laid Back, Hipster Crowd, Colorful Atmosphere! If you're looking for a funky place that attracts a younger crowd, then Leica Cafe is the place to go! This cafe' is a little out of sight from the Moika River, but look for the big sign advertising for this small and cute cafe. With English-speaking wait staff and menu, this is a lively place to meet friends for some great coffee or Caucasian cuisine. The menu is a mix of Asian, Italian and Russian; and we think the Thai soup with ginger and coconut hits the spot. But the Chicken Kiev is spot on too! On weekends, the dining room goes disco! Cosmopolitan setting, Dessert hall, Lunch discounts! Another dining spot to add to your list is Denisov & Nikolaev, a cozy cosmopolitan cafe restaurant and well-known dessert-hall where you can sample desserts in a home-style setting or dine in the stylish restaurant. With emphasis on European-Russian cuisine, the menu is small, but the offerings are perfectly prepared. Popular dinner entrees are Pasta Carbonara, Salmon Pelmeni and Beef Stroganoff. A lunch favorite is the Chicken Salad with bacon and honey mustard. And, if you're looking for soups that taste like Grandma's, you'll find them here. Exquisite French Fare, Open 24/7, Sophisticated Ambiance! 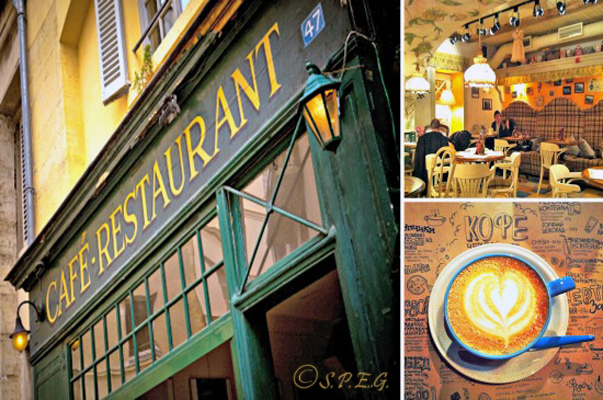 Named after one of the first French cafe restaurants in St Petersburg, which was housed in the same building, Cafe Du Nord 1834 is an authentic Parisian cafe offering delightful and traditional French cuisine. For breakfast, you can enjoy a delicate French croissant or eclair with a tasty cappuccino. And for an evening meal, Du Nord's impressive menu offers exquisite hot courses such as salmon pate with pistachios, steamed halibut and duck leg confit. If romance is on your menu, views of the city from your window table will be enchanting and memorable, especially if you're dining late into the night. Charming Setting, Freshly Baked Desserts, Ideal Meeting Spot! This is where contemporary décor meets historic beauty that welcomes you at the door. At the heart of The Grand Hotel Europe in St. Petersburg is the Mezanine Cafe' - a quaint and private setting that will charm you into the world of indulgent temptations with freshly baked cakes and exquisite chocolates that have been hand made in the hotel's own chocolate factory. Like a delightful oasis in the midst of the bustling sounds of historic St. Petersburg, this luxury tea room will draw you into it's mystique and invite you to unwind to the delicate sounds of a live harp or melodious notes of a lilting guitar. Summer terrace, Divine desserts, Nice place to relax! If you're looking for simple, fresh, healthy fare served with impeccable hospitality, we invite you to dine at one of our favorite cafe restaurants in St Petersburg, Schastye. Meaning “Home of Happiness” in Russian, this popular cafe restaurant is an ideal spot to enjoy brunch, lunch or dinner in a relaxed atmosphere. With sophisticated décor in white and pastel shades, whatever Schastye chain you choose, you'll be transported into a world of casual elegance, European cuisine, alluring pastries and mouth-watering desserts. If you go, enjoy free Wi-Fi, and plan to stay awhile and take things nice and slow. Lovely breakfasts, Wine tastings, Popular after-work place! One several franchises in a popular chain of cafe restaurants, Jan Jak is known for its contemporary black and red mirror-clad interiors and traditional French bistro-style cuisine. If you want to mingle with a lively crowd of entrepreneurs, creative professionals and foreigners, this is “the place” for after-work cocktails. Russians also frequent Jan Jak for the superior breakfasts, superb dinners, excellent wine tastings and the convenience of the smoking lounge. Top-notch service and an easy atmosphere make this traditional cafe a relaxing place to start or end your day. Georgian Cuisine, Cozy Nook, Feline Friendly! Yes, it's true! This is a cat lover's oasis, where guests can mingle with feline friends! The story of this is an interesting one, so be sure to ask your server about Cat Cafe's history. The other main attraction of this small, cozy cafe restaurant is the outstanding Georgian food, which is said to be the best in St. Petersburg. Aptly described as satisfying comfort food, the Lamb with lavash (flat bread) is a dish to die for. We also recommend a wonderful tradition at the end of your meal – a drink of delicious Georgian vodka.